D&K Flood Mitigation Designs Deliver in First Major Storm After Irene - DuBois & King, Inc. Since Tropical Storm Irene in 2011, DuBois & King engineers have assisted numerous communities to not only repair storm damaged infrastructure, but to build resiliency into infrastructure to mitigate damage from future storm events. The culvert diverts overflows from the Neshobe River and directs the flow beneath US Route 7. 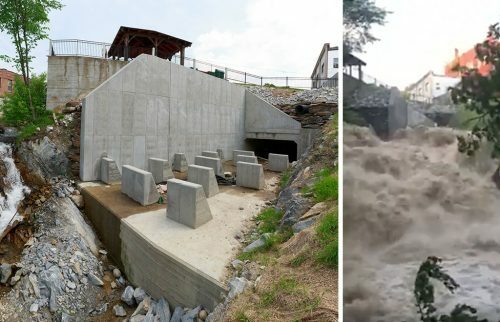 Photo on left: Energy dissipating baffles at overflow culvert outlet. Photo on right courtesy of Gourmet Provence: Storm surge flowing over outlet baffles. Neshobe River Overflow Culvert. Brandon, Vermont had significant damage when TropicalStorm Irene caused flooding and overtopping of US Route 7, which runs through the town. A constricted section of the Neshobe River runs through the downtown including under the town offices and multiple other commercial buildings. Floodwaters damaged town offices, downtown infrastructure, roadways and US Route 7, as well as private and commercial properties. DuBois & King designed an overflow culvert to divert storm flows and prevent the Neshobe River from overtopping in the congested channel. The overflow culvert was designed to redirect up to the 500-year storm event under Route 7, and away from downtown businesses, properties, and town offices. The Town of Brandon received a Hazard Mitigation grant of $2.55M from FEMA to fund the design and construction of the overflow culvert. Construction was completed in May and the investment has paid for itself in one storm event. 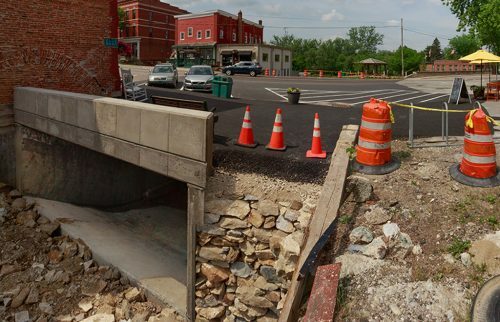 On July 1, this year, heavy rains pounded the state causing numerous road closings, wash–outs, and state-wide flash flood warnings, but downtown Brandon was spared flood damage as the overflow culvert did its job. Gunners Brook flood mitigation in-stream collectors. Gunners Brook Flood Mitigation. Gunners Brook runs through a congested, constricted section of Barre, Vermont and was the site of repeated flood damage caused by woody debris jamming. DuBois & King evaluated Gunners Brook in both the Town and City of Barre and made recommendations for a flood resilient channel design standard to be used to replace the existing channel walls, to provide debris collection at locations other than bridges, for the development of a debris management plan to guide public works staff, and for property buyouts/removal of selected structures adjacent to the channel. In-stream debris shown in collection racks from July 1st storm event. DuBois & King worked with the City to obtain a State of Vermont Ecosystem Restoration Grant to help fund the construction of a multifaceted flood mitigation project. The project includes urban floodplain restoration and hydraulic and structural design of two in-stream debris collection racks. 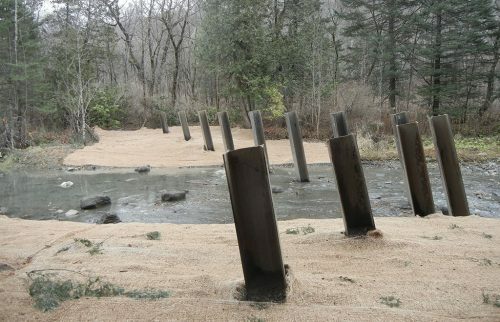 During storm events, woody debris jamming was a significant cause of recurrent flooding due to the artificially narrowed stream channel, which was built up with vertical granite block walls and choked by undersized stream crossing structures. Repeated flooding caused economic damage and contributed to erosion and water quality issues in the area. The new in-stream structures allow controlled collection of woody debris and limits migration of debris downstream where additional jamming could occur. It is believed these structures are a first-of-their-kind in the United States. One structure serves as the primary collector upstream and the second structure is designed to collect additional debris in a controlled fashion within the urban area. 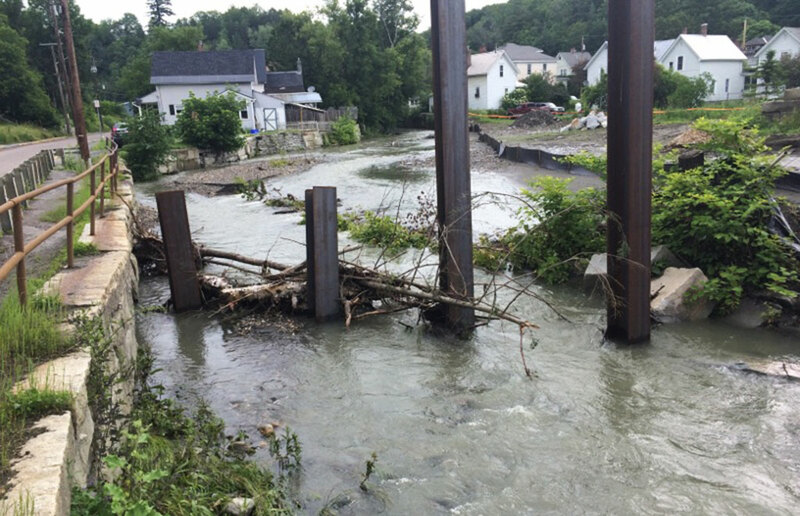 The recent July 1, Vermont storm event tested the constructed in-stream debris collection racks and verified that the debris collection systems mitigate flooding by capturing debris upstream before it can collect in bends and bridge openings downstream contributing to out-of-bank flooding.